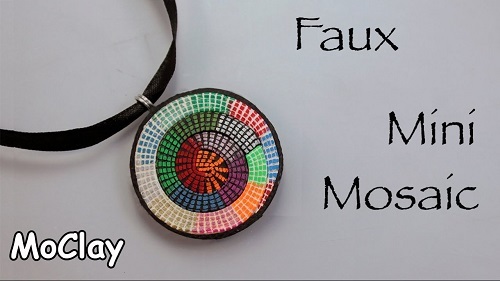 Mo Clay's micro mosaic polymer clay pendant tutorial is so colorful! At first I though she had done a cane tutorial. But no, it is a truly clever and innovative way of using chalk pens and a plastic mesh template! You can also get acrylic paint pens. She chose to spiral the mosaic strip. But you don't have to. Use the technique in different ways. Are the Chalkola colors permanent after baking? Do you need to use a sealer? Mo Clay didn't say so, but I would definitely use a sealer for extra protection. I like this! Of course I enjoy adding colour to polymer clay in different ways so this appeals to me.